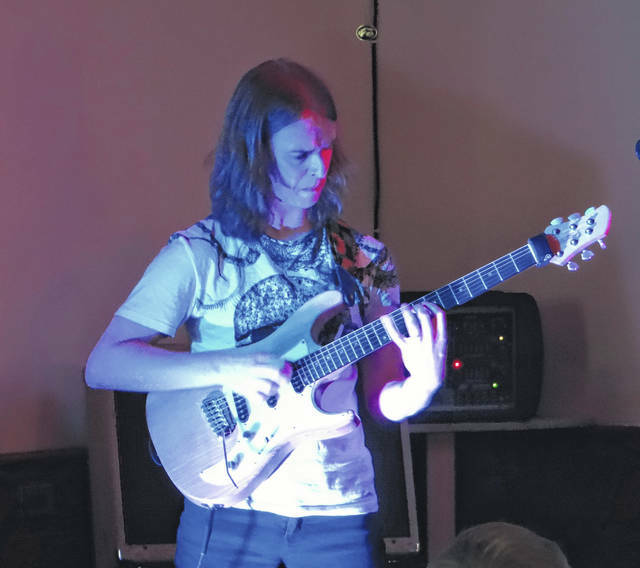 UK guitarist Paul Bielatowicz performs at Blend of Seven Winery in 2015. Bielatowicz will be providing live soundtracks to silent films on Dec. 10 at Blend of Seven in Delaware. The unusual concoction of silent films and electric guitar will be on full display on Dec. 10 when guitar virtuoso Paul Bielatowicz returns to Delaware to provide live soundtracks to silent films. Bielatowicz is from the UK and has worked with many names from the world of progressive rock, including Carl Palmer (ELP, Asia), Steve Hackett (Genesis), Mike Portnoy (Dream Theater), Neal Morse and Les Paul. On Dec. 10, Bielatowicz will be at Blend of Seven Winery located at 1400 Stratford Road, Delaware, where he will perform the works of composer Claude Debussy to serve as musical score for the silent films of George Méliès. Bielatowicz said the combination came about in an unusual way. Bielatowicz wondered if the pair had ever met. Bielatowicz said he started performing live soundtracks a few years ago, and he’s excited to bring the show to Delaware because it has a lot on display. Bielatowicz said he’s performed in Delaware a number of times, and he’s enjoyed each visit. A very limited number of tickets will be available at Blend of Seven Winery – $17 cash ($20 credit card and at the door); Pats Endangered Species Record Store, 11 W. Winter Street, Delaware – $17 cash only; and Delaware Music Academy, 27 W. William Street, Delaware, $17 cash only. Online sales through Eventbrite.com (fees apply). For more information, call Blend of Seven Winery at 740-417-4286 or Rolf Remlinger at 740-816-2685 (email rremlin5@aol.com). Remlinger, one of the event’s organizers, said the show is “unique, different and entertaining” and hopes Delaware residents attend the event.